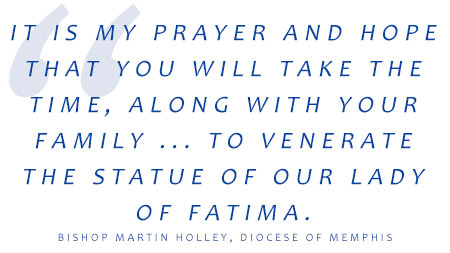 The very same statue that Sr. Lucia, Fatima seer, and Pope Pius XII sent out into the world to take the message of Fatima in 1947 is coming to the Diocese of Memphis. It is the world-famous International Pilgrim Virgin Statue of Fatima. Her pilgrimage across America in 2016-2017 is a nation-wide call to prayer and penance for peace in our nation and conversion of hearts. That’s because prayer is more powerful than any army on earth. Our Lady promised, “in the end, my Immaculate Heart will triumph.” The tour and your prayers will create an outpouring of grace to allow Our Lady of Fatima to claim her dominion over our country through her Immaculate Heart. The statue will be in Memphis from May 2 – 5. Bishop Martin D. Holley has encouraged all the faithful of the Diocese to make pilgrimage to the statue and experience the message of Fatima. The Fatima archivist has said, “Never in the history of the Church have charisma descended upon the people of God as through the Pilgrim Virgin.” To make pilgrimage and experience the grace join the tour; check out her tour schedule.